ME (leaving bar): Oh I’m just right in front here on the bike rack. FRIEND (usually MALE): You’re on a bike? FRIEND: I can give you a ride… You’re way too pretty to be riding a bicycle! I can totally fit your bike into my car/truck/minivan. ME: No thank you. I love my bike and I’m excited to ride through the city this evening! Never mind the subtly harassing yet (I’m assuming) well-intentioned comments on looks- it’s far past the scope of this blog and anyway I often roll past things like that unless things cross into creepy. I’m not saying that it’s good that I’ve learned to roll past it, just wanted to point out that I know it happens but that’s not my specific frustration here. Where I get frustrated is the implication that riding a bicycle is somehow a lesser activity. Like, in people’s minds, someone who’s dressed nicely and styled her hair has no business debasing herself on a 2-wheeled mechanical vehicle. “Who would choose to ride a bicycle?” That’s what people imply. It must be some unfortunate circumstance that a pretty and employed person with hobbies, talents and nice teeth has ended up on a bicycle. I should offer her a ride so she can remember she’s better than the circumstance. I’m not saying it’s not nice at the core to have someone want to help you out. But I AM saying that riding a bicycle is a positive and affirming life choice that people consciously make (or have made for them and they realize the merit of it afterwards). Walking directly out the door to unlock my bike and burning off a couple beers as I huff it directly to my apartment– no searching or paying for parking spaces– is plenty awesome. Seeing a dozen bicycles on a bike route and realizing how many cars would be stuck in traffic if we’d all driven is awesome. Feeling your heart pumping as you crest a hill and look out at the vista is awesome. Enjoying the side street view as you ride with friends is awesome. What I’m getting at is, riding a bicycle is not a lesser experience in any way. It seems like it should be a compliment when you’re told somehow you’re “too good” for a bicycle. But it isn’t a compliment: Riding my bicycle is a part of my life I absolutely cherish. Saying it’s beneath me somehow is a putdown. Now, that doesn’t mean that if- for instance- it’s suddenly raining hard, my lights are broken, the destination changed to somewhere substantially farther away, or we needed to travel together that I would eschew a polite offer of a ride with you. Basically any legit reason an offer is made, its appreciated even if not taken. The insult arises when it’s offered with the only reason being “you’re too good for that”. I have a license. I’ve never had an accident or DUI or any serious violation in an automobile. In regards to the above, I’ve talked to people who have been in those situations who embraced riding a bicycle, have become active members of the cycling community, and have really changed their lives around for the better. I have a car to drive. I’ve lived car-free for years, I only maintain a car for the commute to the suburbs (more details to come in completely different post, btw). I’m also a member of Car2go, ReachNow and Zipcar. So please don’t assume that being on a bicycle equates to not having means or access to a car. I can afford to drive. I can afford a nicer bicycle even. It’s not about that. Some people would rather save the money for something else. Even if someone can’t afford it, that doesn’t make cycling a “lesser” choice: Sometimes circumstances set you free. To explain further, all too often it’s assumed in our American culture that once you get to a certain age (16-18 usually), you just start driving. Maybe your parents buy you a car or let you borrow theirs. And that’s it! If you’re poor, you don’t get that dream. But in reality, there’s nothing to it besides marketing, and you can totally rewrite the script the way you want: Some parents buy their teens nice road or mountain bicycles and ride with them for instance. Some parents live in livable neighborhoods where cars are not necessary for getting around and bicycles are faster and more convenient. Not being able to afford a car doesn’t mean you’re not living a dream- period. 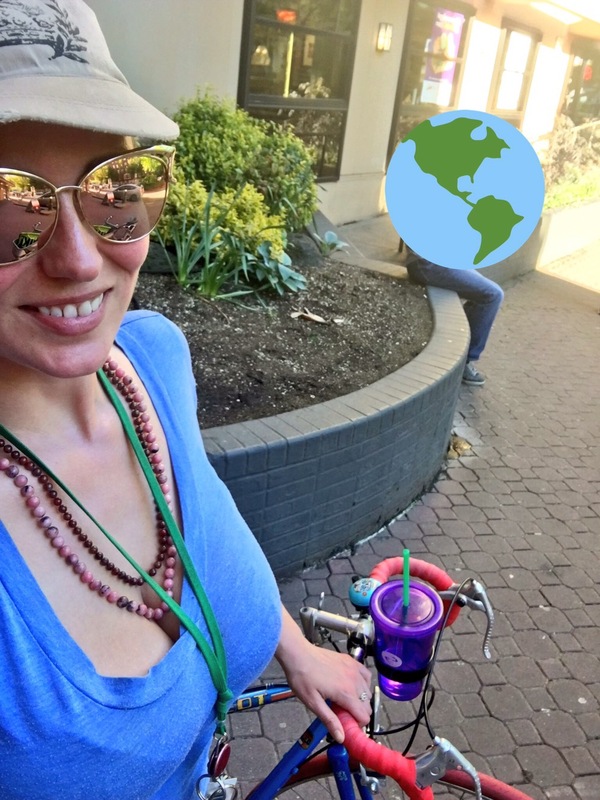 The insult turns even saltier when people imply that my partner should not be letting me ride a bicycle or that I’m dating below my station if my partner isn’t providing me with an automobile and/or ride. None of that is true and all of it is rude, and anyone saying anything like this doesn’t deserve the dignification of a response. TL;DR: It’s polite and appreciated to offer a ride, just be sure to do so only when there is a reason besides that the cyclist is “too good” to be on a bicycle. While that might seem like a compliment, to a cyclist it surely is not nice to hear you are “too good” to do what you love. Previous Post This is your chance to own Gem if you’re in the greater Portland area! Too good, that’s different from too pretty. The comeback for too good might be, You really don’t know me very well, just how badass I can be. Are you kidding? That’s my secret to being in great shape. I’ll race ya to the corner. R u on Facebook? I’d be honoured to be able to FB friend you. Your writing is good stuff! Thank you! I’m at Facebook.com/cpatricolo let’s connect!